On November 11, we look back to past heroes. On Friday the 13th we worry about bad luck. So what happens on Thursday, November 12? We look to the future and hope for good luck. Even if newly unemployed. The day started early in Cambridge, about an hour west of Toronto. The Benefit Guys were hosting a half day seminar on The 21st Century Consumer. I was presenting How To Succeed With Entrepreneurs Part 1. I left early, skipped lunch and raced through highway/city traffic for 70 minutes to get to my downtown Toronto office for a must-attend meeting on the annual retirement roadshow. Since I have no involvement with retirement products, I didn't know why I was needed. Minutes later, I found out. I was reminded that sales through National Accounts were low, expenses were high and profitability was poor. There were no prospects for a quick turnaround. So I was losing my job effective immediately. I asked if anyone else was affected but they would not say. I figured I was the only one, which was not a pleasant feeling. National Accounts have offices across the country and include the places most people bank and invest. I spent most of my time supporting independent regional firms but was part of the National Account support team. I was left with the HR representative to review a two page summary of statutory benefits and additional severance. The package looked reasonable for 18 years and 5 months of employment. After she left, an outplacement consultant came in to explain the services they would provide. My emotions were jumbled but I felt optimistic about the future. Although I didn't pick the timing, I was glad to have a financial cushion while searching for new opportunities. I went back to my office to pack up. That's when I learned the whole National Accounts division was shutting down. [Update on Nov 18: officially, these are structural changes and the division continues to exist] The 1pm meeting time allowed synchronized terminations from coast to coast. In my office alone, five people --- including my boss --- lost their jobs. In a strange way, it's comforting to know that others are going through the same thing. Unaffected employees were being told the news in a meeting. I was advised to leave before returned. I did. In the confusion, I forgot to bring my package with me. I tried phoning home but my Blackberry had been wiped clean and disabled. That's efficient. A lot goes through your mind when an unexpected shock hits. Deep down, I was optimistic about the future since I've invested in learning and honing portable skills. We are in the information age and knowledge age are we not? Since you're likely required to leave corporate equipment when you exit the building, plan ahead. The company probably has a backup of all your files. That helps them but not you. In my case, my company notebook computer was in my car and I took it home without thinking. What a blessing. As a precaution, I already had backups of my personal files on a portable hard drive and home LAN. Each day, I followed a multistep synchronization process: work computer to portable hard drive to home computer to home LAN. And vice versa. At most, I'd lose one day's files. Online offsite backups are worthwhile too. I have yet to investigate options but will soon. If you have a desktop computer, a USB memory key works well (unless it's blocked). Ideally, you'd keep no personal files on company equipment. That was a key reason for getting a netbook computer recently. You can probably find instructions for copying personal information by searching online. However, you should already have a scheduled backup strategy in place. As I left the meeting, my Blackberry had already been reset. The contacts, calendar and emails were all wiped out. The phone still worked but I didn't realize this until the next day. Synchronizing contacts was a bigger problem because the Outlook Import/Export feature was disabled. It only seems to work when connected to the corporate LAN. I found this out when exporting my contacts to LinkedIn months earlier. 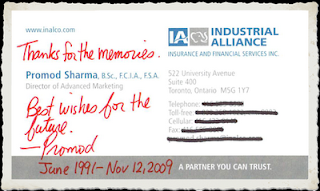 Luckily, I routinely scan business cards and store them in PersonalBrain (reviewed earlier). Calendars are a problem. Mine are entirely electronic, which meant no paper backups. While Outlook synchronizes with my Blackberry, that's of no use when you leave your equipment behind. Luckily, Google Calendar Sync can help if you use Gmail. When you're ready, post a quick status update to let your connections know you're now self-employed. For dramatic effect, I waited until the next day, Friday the 13th. Since all my future work commitments were now cancelled, I alerted the parties affected in the near future. Why not make your exit easier on them too? Now it's time for a sabbatical before deciding on a future direction. Promod: I'm sorry to hear about your job loss. I'm sure you'll find a suitable opportunity soon but it is devastating nonetheless. Take care. This is a powerful post - thank you for sharing your most valuable lessons learned Promod. Many peers are never prepared and end up much more shaken by the process than needed. 90% of my tenured business contacts lost their outlook contacts by the way - good tip. 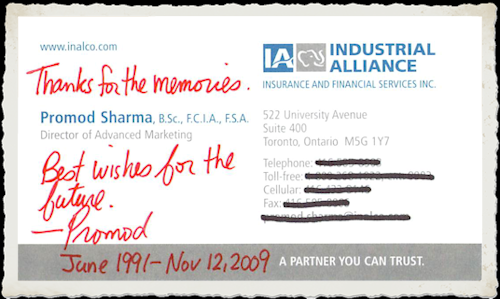 A special thank you for reminding professionals to change contact information right away. In an age of great "Executive Search" consultants this will help things get and keep moving much faster.